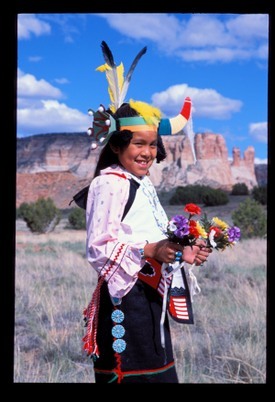 The Hopi have restrictions of where and what you can photograph. My guide made sure that I did not take pictures of anything taboo. I was introduced to kachina carvers, pointed out ancient pictographs on canyon walls and showed me his cornfield during a drought year. Photography was allowed for all these subjects. Modern and traditional medicine men along with powerful potions from yellow bee pollen to Corn Mountain. Medicine men use their special abilities to channel medicine, or power, to influence events as well as to heal the sick. In many cases, the word "medicine" is interchangeable with the word "sacred". Each tribe has their own unique culture, language, symbols and now flags. Thanks to the Manataka American Indian Council. Here you will find official flags that represent each individual tribe. Their motto is "Show Pride in Your Tribe... Fly it High". While traveling through a tribal community I'll generally photograph their tribal flag which usually fly's on a pole next to the stars and stripes flag in front of tribal offices. A quick snapshot of the flag works as a strong illustration in my photo collection that will represent a tribe's government. Many times throughout the year a publisher of educational materials will request a flag, logo or tribal government photo. My image collection has a great assortment that I just don't have on hand yet. When this happens, ordering a specific flag from the American Indian Council for a photo shoot is a must. They have the largest supply in the world. These beautiful flags are not Wally World cheapies. Depending on what you order, flags vary in price from $15-$155 for each flag. Another company that I use is TME Flag Co. To encourage tribes to adopt flags, TME Co. has offered a grant program to ‘flagless’ tribes to design, produce, and sell their flags. So far the Apalachee, Chinook, Clatsop-Nehalem, Jatiboniku Taino, Munsee, Native American Indigenous Indian Community, Northern Tsalagi, Pokanoket Wampanoag, Sakaogon Chippewa, Shoshone-Bannock -- all have benefited from this program. I hope many more will. Both companies flags are of the highest quality. Screened by the most modern acid-dye penetration process for brilliant, long-lasting colors. Each long-lasting 3' x 5' flag is made from high- strength, top-quality woven polyester bunting material. Four full rows of stitching in the fly and two rows of white canvas header are carefully sewn around the entire outside border to provide excellent durability. Two real brass, weather-proof grommets. Made for indoor or outdoor use. Sounds like an ad. But their quality is outstanding and the variety of choices are the best. There's over 131 authentic tribal flags available on their website. Including a variety of other American Indian flags such as historical, novelty, healing and freedom flags. Supplies such as flag poles and accessories can also be ordered. Hands down the flag photo that I get asked for most is the Iroquois Six Nation Confederacy flag. I only wish that I could afford to buy or rent all the flags so that I could photograph each one flying magestically on a flag pole with billowing clouds dotting a blue sky in the background. Adding more imagery to an already larger than life extensive photo collection on Native American Indian cultures. Due to the plummeting economy, my photo trips and destinations have been put on hold. However, last June I decided to visit Anita, one of my best friends, in Southern California and to make an appointment with a doctor that she highly recommended. A planned trip always intrigues me to research the Native tribes of that particular area. Here was my opportunity to do what I enjoy most. That's to shoot pictures that show American Indian cultures. Through a Facebook friend, I made contact with Jacque Tahuka Nunez of Journeys To The Past. Jacque is a bearer of traditions of the Acjachemen Indian Nation (Indigenous people of Orange County). Little did I know about the "Hollywood style" production skills of this incredible woman. Through phone and email conversations we scheduled a photo shoot that would involve five people to depict early village life. Jacque found a perfect location of a recreated village just outside of LA at the Santa Fe Springs Heritage Park. About 5 years ago, on a photo trip to S. Cal, I had previously photographed on this site called Tongva Village. So I knew ahead of time on what to expect. Opportunities of brush dwellings and a large pond with waterfall. Limitations of wire fences and the site being open daily to public visitors. With Anita acting as my driver and production assistant, we headed off to meet our models and set up the photo session for that day. Like most of my Native American acquaintances when we need a variety of models, Jacque used her family pool. She would act as elder (although she looks young) in the village set-up along with her daughter-in-law and three young grandchildren. The most difficult part of the shoot was going to be the ages of the children. Two, three and a five year old who was a highly active youngster. Photographing young children is a whole lot like photographing puppies. You have to go with the flow and wait for something to happen. If you attempt to give any sort of direction then generally it's ignored. I lucked out. The children were all very patient, intrigued with using the artifacts (more like playtime than acting) and were delighted to wear historic garments (not to mention how adorable they looked). The only thing that was a problem through the whole shoot was that I felt so overwhelmed and unprepared for all the activity going on at the same time. In one corner we had the grandmother basket weaving, in another area the little girls were climbing on the tule boat while the young woman would be dipping a gourd cup in the stream. The boy would be intrigued with the fishing net only to drop it and quit once I had the camera set up. My other dilemma was trying to use my DSLR to shoot both stills and video.Through sweat and chaos we all got through it some how. Just happy that the parents brought juice and snacks! This week I got the courage to sit at the computer and start editing through the hundreds of photographs captured. After a long session narrowing the choice down to "the jewels" of the shoot, I was instantly surprised at how much we actually accomplished. The shoot turned out to be a great success! The priceless images will be a significant addition to my Nativestock Collection and for educational publishers. Already Jacque has plans to print postcards and is working on a book project that will add an assortment of these photograph's. By using the photographic medium as my tool to bring Native cultures and traditions to the world, I feel so blessed to have captured living moments in time. Every time I press the shutter, I strongly feel that a higher power or the Creator steps in to make the picture happen. I'm only there to physically press the button. Native American stock photography is my business. For the past 14 years my passion and career has been traveling throughout Indian Country across the US and Canada documenting hundreds of tribes. large company such as Coca Cola or Chevrolet. So far big conglomerates like Nike still have yet to call my studio in need of Native American stock photos. All my photography work is on a free lance basis. Meaning that I don't get paid unless someone hires me for an assignment. My last assignment was back in February. A large portion of my photo shoots are self assigned project and have been self funded. When an individual from a business or government agency begins their research to look for Native American stock images to illustrate a project they generally will start their search on Google. Most of the time my business Nativestock Pictures comes up first place when using search engines. I also have a long list of clients who have used my photo collection for the past several years and are well aware of my photo archives. These clients include National Geographic, Houthton Mifflin Harcourt textbook publishers, the History Channel and many more who will contact my studio via email or on a rare occasion by phone. Most photo researchers will go directly to my website to use the keyword search function typing in search terms such as 'wigwam', 'potlatch', 'family' or 'trail of tears'. Some researchers prefer to browse through folders of tribes or territories or common searchers. With over 20,000 images posted online, researchers want to look until the right Native American stock photo pops out. Free research is always an option. No one else knows this collection better and I can find a nice selection of images very quickly that specifically appeal to each project or client's individual needs. With digital photography came a flood of images available online for purchasing as stock photography. There's also a wide open price range, which is great for image buyers. Today anyone can buy a basic ho-hum microstock image at $5 each or a one-of-a-kind rights managed image with model releases from photographers who specialize in niche collections. Rates are generally calculated in the size that is requested such as web 72 dpi or up to 70 MB that can be used for a billboard. Other pricing varieties will depend on how and where the image will be used such as a brochure with a print run of 100 versus the Wall Street Journal that has a daily print run of 1 million. excellent Native American photos to this collection is a great priveledge. Children and college students use my website to collect information for their reports. Many web browsers who want to look at photos on American Indian arts and crafts will browse over my collection and spend considerable time there. Libraries, schools and museums will request 1 hour presentations on Native American cultures and multi-media slideshows that I've produced. Recently, a few out of state galleries have contacted me in regards to having a show to exhibit my years of photographic artwork on America's First Nations. There's no other job or commitment that I would rather jump out of bed each morning to do than to continue to shoot and showcase Native American pictures. It's a lot of hard work and expense but well worth it when I can make a modest living and receive comments of appreciation. Even though there's continuous challenges, I plan to continue bringing stock images of Native cultures and their communities to the mainstream public. 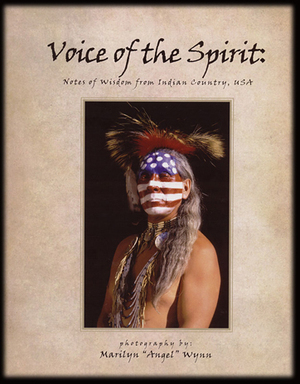 To bring a better understanding of today's American Indian traditions, history and lifestyles. I hope that I've answered some of the mysteries and questions about my unique occupation. If you would like more information or have a question then just send me a comment. I'd be more than happy to drop you a line. Until the last few years, portfolios were used by photographers to help get them hired for their next assignment. Photo editors no longer request portfolios (which is a fancy word for a collection of tear sheets gathered from previous assignments). Today virtually all artists are asked for their website address. Your dead if you don't have one by now. Which makes sense in our fast evolving techno world in which we live in. After cleaning out a storage closet, I came across my portfolio from years of gathering dust. A leather bound binder stuffed with tear sheets that hung loosely between two saddle brown covers. As I flipped through the pages of nostalgia, it dawned on me that I no longer received calls for assignments. Pretty much all the emails that I receive today are from photo buyers just looking for stock images. Stock images is a product that you as a photographer go out and take pictures at your own expense to produce photographs that in the hopes one day will be requested by a publisher, web designer or such. And with further luck, you will make a sale and then will license the non-exclusive image as a use to the buyer thereby earning some of the cost back that you invested to create this image. Expenses like travel, camera equipment, model fees, etc. It use to take about 3 years to pay off a photo shoot. Luckily for me it only takes maybe a year or two to make back my investment. But then that's after the image has been posted to my website. I'm back logged with many digital photos I took over 3 years ago that still sit on hard drives waiting to be processed and uploaded for market. So it might now take 4-5 years before I reap any rewards. So, back to my pile of artist samples. What to do with my aged portfolio with pages falling out? I decided to scan assorted picks of the ads, brochures, articles and cover designs and post them onto my Facebook and website. Maybe even write a blog, which I'm now attempting, about the good old days when artist's touted around their treasured portfolio to find jobs and win assignments. Here at the bottom is a small selection of tearsheets from my portfolio that showcase a variety of images from Nativestock's picture collection which have been used for education, business and non-profits. With an image collection of well over 150,000 photographs (to date only 15% of this collection has been posted to my website). Assuring picture buyers and photo researchers to find the right image for a project related to Native American Indian culture and lifestyles, both traditional and contemporary. Affordable usage rates apply. I appreciate any comments that you may have on my selection of tear sheets from past publications who used my work to illustrate their projects. Once again, National Geographic is licensing the use of another image from the NativeStock Pictures image archives. The image is of a sacred landmark known as Corn Mountain located on the Zuni Indian Reservation in New Mexico. The scenic photograph will be featured this month in National Geographic's KIDS monthly magazine. Photographer Marilyn Angel Wynn, who took the photo of Corn Mountain during a photo trip to the Southwest 3 years ago, is not new to NGS. Her images have graced many of their various publications in the past. "Back in the mid 90's I worked for a well known Idaho scenic photographer. National Geographic called our office looking for a photo of a backcountry Lewis and Clark Scenic Loop along the Lemhi Pass", Wynn said. "We didn't have any images from that location so the next morning I woke up at 2 AM and drove 125 miles to be there right at dawn". Well, her speculative drive and photo trip paid off with an awesome sunrise! Right at the time that the pre-dawn magic light started to illuminate the landscape, Wynn stopped her 4-wheel jeep to the side of a country highway. She jumped out with her camera and right where she had parked was a small herd of horses. The animals thought she had come to feed them so they came trotting up to the fence line. Right then she started shooting. Once the horses realized that she wasn't there to serve them their morning hay, they turned south and started galloping away. Click click click. The photo op ended as fast as it began. Only 3 shots were fired. Those were the days when professional photographers used E-6 slide film. Wynn waited 2 days before she could view what she'd captured. A tight edit of twenty shots taken during that special day were submitted. But it was the running horses that caught the eye of a NGS photo researcher . At that time, Wynn made documentary video programs so her knowledge in the technical part of photography was hit and miss. Fellow photographer and Wynn's mentor, Jack Williams, commented, "Angel is probably one of the few photographers that's ever been published by National Geographic who didn't know the difference between an aperture or shutter speed". Wynn immediately responds with a laugh, "Well I certainly do know the difference now!" "When I was a kid, I'd visit my grandparents house and enjoyed thumbing through their subscriptions of yellow books, a fond term photographers call National Geographic's well known Magazine. Seeing these incredible photographs of exotic countries, cultures and history... it all came alive", said Wynn. "Back then I never thought that one day I would become one of their contributors. It's just an honor to have your work considered by this monumental magazine". You can view more of Wynn's award winning photographs on Native American cultures by going to NativeStock's website. After spending years to photograph hundreds of American Indian tribes throughout North America, it takes dedication, focus and lots of travel. These pictures make up a large photo archive called the Nativestock Collection. Each year I pack up my camera gear and head out to tribal communities. Through research and some scouting, I look for individuals that know their culture, special events, historic exhibits and any other unique photo opportunity found on reservations and traditional homelands. You may have a suggestion about a special event, tourism in your area, people willing to model or for any other reason that I should come to your area. How about being hired as my photo-assistant? I pay individuals a day-rate and models by the hour. No experience necessary. You only need to be familiar with locations in your neck of the woods and know a handful of tribal members that are artisans, elders, leaders and traditionalists of any age. Maybe you have a family member that would like to be hired as a model or assistant. Post a message in the comment area or email me at nativestock@mac.com with your contact info and why you think I should come to your area for a photo-shoot. For some individuals, this opportunity could turn into a career in location scouting, assisting other photographers or a job on local film production. A few States that are on my wish list to photograph a tribal community or reservation are with an assistant for a few days are Kansas, Minnesota, Maine, Louisiana, Alabama, Mississippi, Washington and Colorado. I'm open for all areas in Indian Country and I plan to hire an assistant for a few days at each location. If you are a tribal member and interested to work with me as an assistant on one of my photo shoots, or know anyone else that would like this paid opportunity, then send me a note. Tell me a little about your homelands and why you feel it needs to be documented with pictures. Oh and by the way, those interested need to have a good sense of humor to apply for this position. As you can tell by viewing my vast collection of pictures, many of the models and talent proudly represent their tribal nation's heritage. I work with Native people who are young, old, talented or not so talented, horsemen, storytellers, families, teen role models, artisans and musicians. 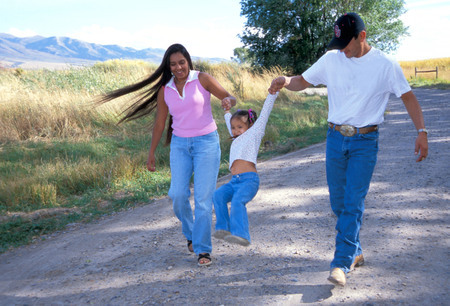 I look for regular plain everyday folk living on reservations that are willing to share their lifestyles. Shooting trips are generally planned around festivals, cultural presentations and re-enactments. Repeat requests for specific tribes take preference to where I travel. However, I like to take my chances and stop along the way to visit as many tribal communities. As a stock photographer, after shooting over 100,000 pictures, I eventually acquired a small collection of images that are consider my absolute best. There are probably no more than 150 of these celluloid diamonds I'm so proud to have captured. These photographs are today what I consider my gallery collection. Many of these 'once in a lifetime' images have never been requested for use by publishers. These photos have been sent out a number of times in submissions to educational publishers. But what gets chosen are my basic mundane "just a shot" kind of pictures. Nothing too moody, romantic or inspiring. Just an image to illustrate their books...pictures with average lighting, colorful and simple. So, I decided 'what the heck' I'll publish my cream of the crop pictures myself. That was three years ago. I never did try to pursue a publisher at all. For those of you who do not know, Brooks Photography Institute is one of the top prestigious film schools for teaching professional photography techniques. It is a 2-year course and also has a 3rd-year for a masters degree program. Students, or more realistically their parents, pay a whooping tuition of $100,000. After graduating Brooks Institute, like the world needs more photographers, these eager students are ready to show the world their stuff and flood the photography market looking for the oh so promised high-paying jobs.